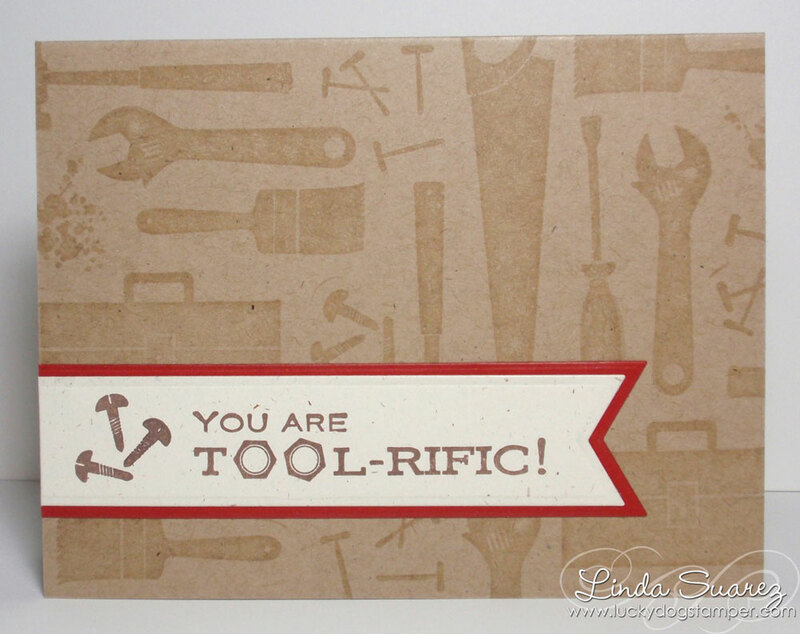 Lucky Dog Stamper: You're Tool-rific! Today I have a really simple, almost one layer card I made for my dad for his birthday. 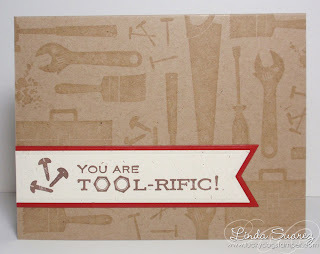 I used the Tool-rific stamp set from A Muse. What a great set to have for masculine cards, especially if your guys are the fix-it kind. I cut a card base from PTI Kraft cardstock and stamped all over it with the different tools using Versamark watermark ink. I love this on the PTI Kraft paper! Then I stamped the screws and sentiment on a banner and added a pop of red. Voila! This card follows one of my crafty resolutions for this new year, and that is to make more mailable cards. I realized while mailing Christmas cards last month that I had to add a lot of extra postage or specially wrap some of the cards I had made. Kind of a pain. So I'm going to try to keep my cards from getting too lumpy. Today is my scrapping day. My scrappy friends are on their way over right now and we'll have a full day of getting our scrap on. I'll be working on my Project Life album (for a trip to Utah National Parks I took in 2008!). Back to cards tomorrow! Perfect guy card, and I love the sentiment! Great guy card Linda!! Love the tools! !